Provide comfort for the family of Hazel Faught with a meaningful gesture of sympathy. Hazel Knight Faught went home on February 5, 2019, to be with her Lord. She was a very sharp and feisty 92 years of age. Hazel was born April 11,1926, in Billings MT, the only child of Elmer S. Knight and V. Irene Davis Knight. At the age of 5 her family settled in Lodge Grass MT. She was a member of the Little Brown Church and baptized at the age of 11. In school she was very active in sports and won several ribbons in track, played drums in the band, and was a cheerleader for 4 years. At a church youth group meeting she met the love of her life, Bernard (Barney) Faught. They went caroling and held hands. Hazel graduated from Lodge Grass High School in May 1944 and on June 7, 1944, she and Bernard were married. Bernard’s large family finally gave her the brothers and sisters she had always wanted. They had three children, Ronald, Roxanne, and Janelle. They moved several times before settling in Laurel to raise their family. They lived in a boxcar in Newtonville (Laurel) and the depot in Edgar, MT. Hazel and Bernard joined the Laurel United Methodist Church in 1947. She was a past president of the WCSC, taught Sunday School, led the junior choir for 4 years and sang a very strong alto in the church choir. Hazel worked as a cashier/clerk for the BN Railroad until she retired in 1981. Upon retiring she and Barney camped with a trailer and later a motor home. They traveled most of the United States with other Faught family members on their bi-annual motor home trips and attended the Faught family reunions every other year. They visited their children wherever they were living, including Alaska and the Azores. Family and friends were very important to her. 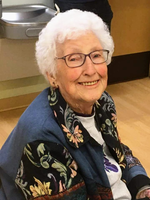 Hazel played in pinochle and bridge clubs, loved square dancing, golf, and participated in bible study classes. She loved to visit and always had an open door for family and company. She enjoyed baking bread, knitting, mealtimes with family, western music, dancing, shopping for good deals, and playing cards anytime. Saturday evenings were for watching Dailey & Vincent, Molly B. Polka Party and Larry’s Country Diner on tv. Hazel and Bernard celebrated 60 years of marriage before his passing in 2004. Mom is survived by her children, Ron Faught of Laurel, Roxie (Gib) Miller of Cheyenne, WY, and Jan Faught of Laurel. Her grandchildren Eric Miller of Greenwood, IN, Daron Faught of Billings, MT, Karl Stanford of Great Falls, MT, Dalayna (Colin) Hillis of Missoula, MT, Paul Stanford of Idaho Falls, ID and Neil Stanford who passed in 2018. Great grandchildren Kellyn Stanford, Skyla (Kayleb) Curtis, Joshua Miller, Mikaela Altman, Conall Stanford, Kira Stanford, and Rheanna Stanford, and great great grandson Tyrian Curtis. Sister-in-law Jean Faught, Kennewick, WA, sisters in heart LuElla (Gene) Kiser and Martha Duckwitz, numerous nieces, nephews, cousins, and many close friends. Mom, you were our history and the reason we kept coming home. It is hard to forget someone who gave us so much to remember. Funeral services will be held at the Laurel United Methodist Church on Saturday, April 6, 2019, at 10:00 a.m. Reception following the service. Visitation will be on Friday, April 5, 2019 at Smith Funeral Chapel in Laurel from 6-8 p.m.
Memorials can be made to the United Methodist Church Choir, Templed Hills Christian Camp or charity of choice. To plant a memorial tree in honor of Hazel Faught (Knight), please visit our Heartfelt Sympathies Store.